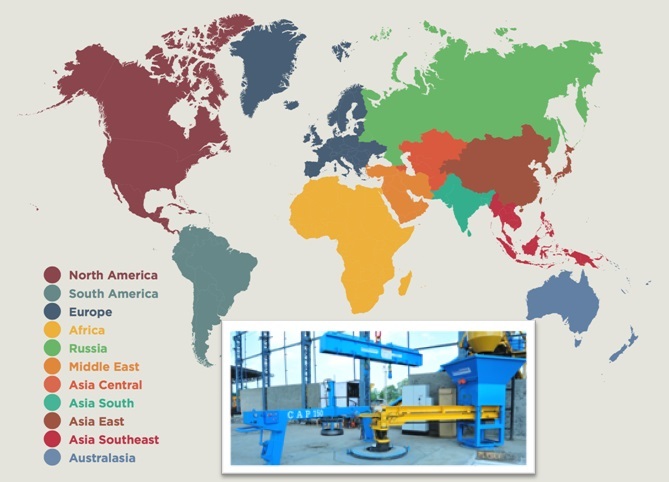 The global supply of concrete pipe machines is still way below the demand as indicated from usage of concrete pipes. Pre cast concrete pipes are different from the convectional pipes in that for precast; the manufacturer has far greater control on the design and manufacturing process than casted pipes. Consequently, there has been a lot of interest in concrete pipe making machines and demand is growing rapidly. There have been a large number of infrastructure projects in the Middle East especially the Qatar region, and the United Arab Emirates. The projects are using great numbers of concrete pipes and have created an increase in the demand for pipe making machines in the region. In addition, with the large number of projects, some countries have had to import these pipes to cater for the increased demand. This results to an overall increase in the cost of the project further creating the urgent need for local manufacturing of concrete pipes. The main demand for the concrete pipe making machines is attributed to development of cities and towns, which have a high demand for concrete pipes in construction of sewers, and storm water drains. With the rapid industrialization and rural urban migration in African nations, there has been an urgent drive to construct these basic amenities. This has gradually created a demand-pull for concrete pipe machines by various investors in the construction industry. The United States, being a global leader, research has shown that there has been a constant increase in demand by over 6 percent per annum. The primary uses of the concrete pipes are in construction of storm drains as well as in manufacture of sanitary sewers. With this subcontinent becoming a major technological hub, the concrete industry has also developed in leaps and bounds. This has seen the manufacture of innovative concrete pipe machines develop as well. Demand for concrete pipes continues to grow in India and surrounding regions. With the rapid infrastructure development and the real estate sector, concrete pipe machines demand is set to grow as more investors join in to support the infrastructure development. Other countries set to benefit from Indian technology include Bangladesh, Pakistan, Burma and Nepal. In the enormous china market, demand for large diameter pipes is estimated to grow at approximately nine percent per annum. Like many others regions, china has been leading in development of physical infrastructure and new buildings. These pipes are used in storm water drains as well as in sewers. Research shows that requirements for the pipe making machines will grow in direct proportion to concrete pipes demand. Other equipments used in pipe construction include cage-welding machines, mould equipments and other pipe making accessories. The demand of these machines has grown also in proportion to the increased demand in pipe making equipments. The status of India being the regional hub in this technology further adds to sustainable regional supply.